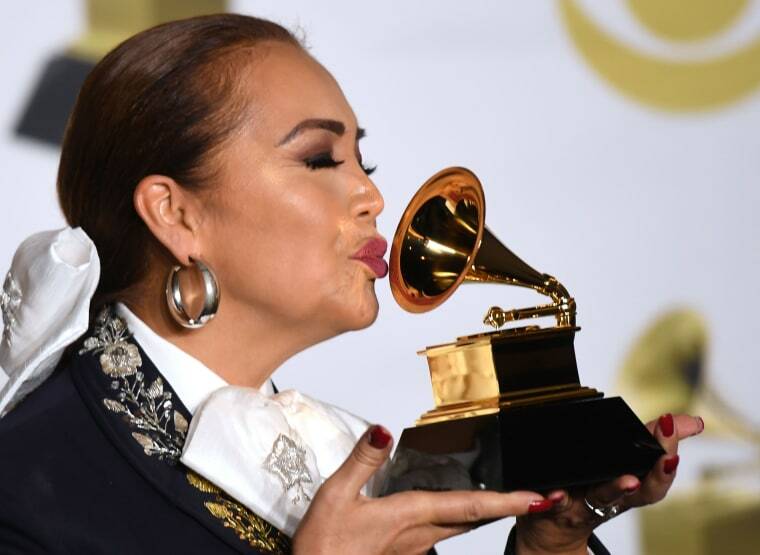 At a time when campaigns like #MeToo and #TimesUp are trying to shatter sexism and empower women in male-dominated industries, Mexican singer and Queen of Rancheras Aida Cuevas is using her Grammy win as a gateway to expand this movement beyond the United States. The #MeToo and #TimesUp campaigns have received some backlash from women of color over the fact that the movement is not all that inclusive. Furthermore, it has tended to focus on the struggles of women in the U.S. Yet women in Mexico and other countries can relate to the same issues these women are highlighting, said Cuevas, especially when it comes to a culture of machismo and domestic violence. RELATED: Hollywood is having a #MeToo moment. Women of color have fought this battle for decades. Cuevas was the only woman to receive a nomination for Best Regional Mexican Music Album at this year’s Grammy awards. When she won, Cuevas made history as the first female Mexican ranchera singer to win a Grammy award in the category, beating all-time favorites like Banda El Recodo de Cruz Lizárraga and Julion Alvarez y su Norteño Banda. “I was surrounded purely by men, and I was blessed,” said Cuevas about her fellow nominees. But she also knows her win is important. Rancheras stems from the Mexican revolution and the musical genre is overflowing with drama, passion and patriotism. And like any good ranchera musician, Cuevas wore a traditional charro outfit to pick her Grammy and give her acceptance speech. Cuevas, now 54, started singing when she was just 11 years old. Since then, she has recorded 39 albums and traveled the world with her music. She has sung for U.S. presidents George W. Bush, Bill Clinton, Gerald Ford and other world leaders like Pierre Trudeau and the king and queen of Spain. Throughout her 42-year long music career, Cuevas has won many Latin Grammys and multiple gold and platinum records. But it wasn’t until she went solo that Cuevas made Grammy history. She departed from her music label to start her own and released her first independent album titled Arriero Somos Versiones Acústicas, which is a collection of covers performed with only guitar accompaniments. After this risky move, she won her first Grammy. Cuevas hopes that her trajectory and newest career accomplishment can stir conversations about self-love and women's empowerment. “Women are worth a lot and we really deserve to be respected,” she said. Verónica Albornoz, a correspondent for Telemundo's "Un Nuevo Día," contributed to this report.